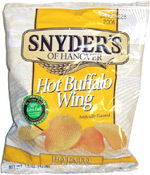 Taste test: Previously, Snyder's made this flavor of a plain potato chip, but this new version adds ripples. (As Buzz Aldrin said on the Simpsons, "Careful! They're ruffled!") Sadly, this small bag didn't have large chips and was only half full. 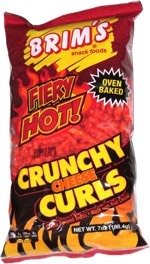 The heat of the chips kicked in fast, so have the water handy if you don't like your tongue getting burned. We couldn't taste the blue cheese that the bag had advertised. Although one taster said there was a creaminess to the flavor, most said this was all Buffalo wing flavoring. I did like the rippled style better than the plain version. They also seemed very salty. Smell test: Oddly, it smells like chicken. Almost like chicken powder soup (boullion?). Weird, huh?